Former Showcase participant Ashley Meier was awarded the "adidas Player of the Year". 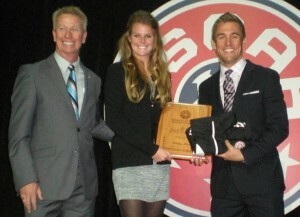 She is pictured here receiving the award from NSCAA President Paul Payne and Taylor Twellman in Kansas City. Former Showcase participant Ashley Meier was awarded the “adidas Player of the Year” in Kansas City. Congratulations, Ashley!